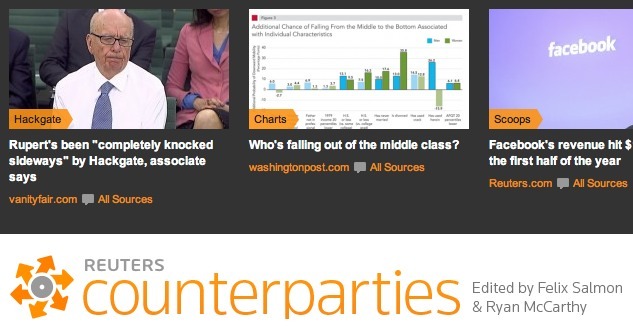 International news agency Reuters is dipping its toe into the somewhat hot aggregator game with a new linkblog called Counterparties. The past few years have seen the AP experimenting with “accountability journalism.” They’ve seen Reuters itself expanding into investigative reporting and commentary and video, news-y and opinion-y and silly. One thing that those experiments have in common is that they emphasize, implicitly, the voices and the personalities and, finally, the brands of the news agencies’ individual journalists. The Reuters blogger goes on to namecheck other aggregators- Fark, Reddit, Techmeme, Memeorandum, and Drudge- in a comparison of the site’s interface and general look. Indeed, Counterparties is a bit more polished and branded than its peers- but it lacks the social aspect and commenting interface that keeps users coming back to popular link sites. It will be interesting to see if Counterparties catches on- even more so to see if it can tease out a readership without the interactive interface.